What is Karns Fresh Rewards? Karns Fresh Rewards is a program designed to allow you to redeem Max Dollars simply by scanning your Karns Fresh Rewards card at checkout. You can earn points for your purchases. One point is the equivalent to $1 spent on participating purchases. Excluded items include: milk, alcohol, tobacco, gift cards, money orders, postage, lottery, pharmacy, EZ Pass, tax, and any items prohibited by law. Karns reserves the right to have additional point exclusions. Points expire 18 months from the end of the month they were earned. How long will it take to add rewards or coupons to my account? Rewards and coupons can be added to your account and will be immediately available for redemption. No, once you add Max Dollars to your account they do not expire. I added Max Dollars to my card – who can use them? Once you add Max Dollars to your card any card that is connected on an account can use the Max Dollars. I added Max Dollars to my card – do I have to use them? Once you load Max Dollars onto your card they will be used the next time your rewards card is scanned register (excluding self checkout registers). If you don’t want to use your Max Dollars do not load the dollars onto your card until you are ready. Are purchases excluded from the promotions? Yes, items including: milk, alcohol, tobacco, gift cards, money orders, postage, lottery, pharmacy, EZ Pass, tax, and any items prohibited by law are excluded from the promotions. Points are listed on the main page of your online account. They are located in a grey box on the right side of the page. You can also check your points under the Points History tab at the top of the page. What if my purchase is not recorded? Please take your register receipt to any Karns customer service office within 30 days of purchase. They will record your receipt information and provide a manual point adjustment to your account. These manual points can take up to 14 days to be applied to your account. You can pick up a Karns Fresh Reward card at any in-store register or customer service desk. 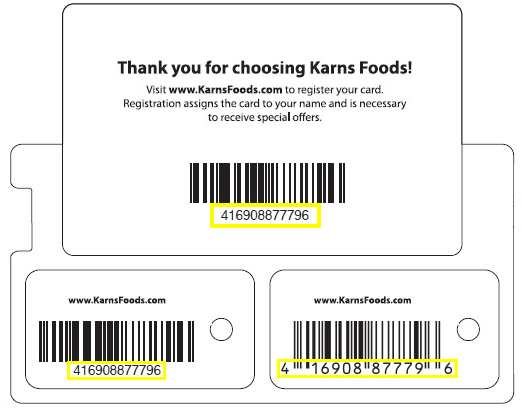 Go to www.karnsfoods.com/rewards to register and create an account. What information is needed to create an account? First name, last name, phone number and street address are required to create a Fresh Rewards account. Email address and date of birth are optional items. If you need to update personal information log into your account and click on "My Account" and then click "My Profile,” add new information and click "Update." Reminder: Email is used as your login to the Karns Fresh Rewards account so changing this field will also change your login information. After you log in, simply click on "My Account" and then click "Update Password," enter your current password and create and confirm your new password in the appropriate fields, and click "Update" at the bottom of the page. Note: Passwords must have at least 8 characters. Simply select the "Forgot Password" link located under the sign-in area and type your registered email address in the box provided. A password recovery email will be sent to this email address. Once you receive the email, click on the link and it will take you to a website to change your password. Type in the new password you would like to use in both fields and click "reset." You can now immediately log into your account with the updated information. Note. If you do not see the "Forgot Password" email, please check your spam folder, as some email providers may mark the message as spam. What do I do if I can't remember my user name or Karns Fresh Rewards account number? Your user name is your email address or full 12 digit card number. Should you forget which email address you used at registration, please visit your Karns location's customer service desk and someone will assist you. How do I add a card to my existing account? After you log in, click on "My Account" and then click "Add Card." Enter the new card number in the box provided and click "Add Card." Karns may at its discretion terminate, change, alter, limit or modify the program including rules, regulations, terms & conditions or benefits at any time without notice. What happens if my card is somehow used during a fraudulent transaction? If it is discovered that a rewards card is being used during any fraudulent transaction all points on that account will be voided. What happens if I end up with a negative balance on my account? If an account is put into a negative balance due to a customer accessing a single Max Dollar redemption multiple times the customer is responsible for the negative balance.